Even though Apple shipped some Apple Watch app developers to Cupertino to help them finish their work, few of them have actually seen the Apple Watch in action. Still, many are excited about the prospects of coming up with a "killer app" for the timepiece which launches on April 24th. We've seen what can happen to the lucky developer who comes up with that app that everyone wants on their phone and tablet. Companies like Instagram (eventually bought out by Facebook for $1 billion) and WhatsApp (which Facebook paid $21 billion for) have made multi-millionaires out of their founders. Not all developers see the same thing happening with the Apple Watch. Apple has prevented developers from accessing the gyroscope and accelerometer on he timepiece. "The limitations are discouraging," says developer Markiyan Matsekh, who has come up with an Apple Watch app to control a Tesla Model S. The biggest challenge, says one developer, is "not trying to take a phone app and cram it into a Watch." 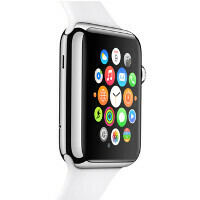 40 apps for the Apple Watch were posted on Apple's website on Monday as the Watch was unveiled for the second time. The company says that thousands more apps are in the works. Perhaps one of them will be the huge "must-have" app for the Apple Watch that will provide its founder with fame and fortune. With that funny battery life, your Watch will always die on you no matter what apps you use. Voila, killer apps! Yawn...people moaning about battery life got old like 6 months ago..
Didnt phonearena write one hundred thousand some time ago? It's a watch, not a phone. I see no reason why it should need more than few handful of apps/features. Make it look less gaudy, more slimmer first. I have no requirement for 500 apps on a watch, I already have them on my phone. Especially when the phone is with you at all times. The one thing I learned about wearing a Android Wear watch is that you don't need to play with apps on the watch. More like receiving notifications from apps that are already on the phone. Swipe to dismiss and go about your business. People will learn this soon enough.